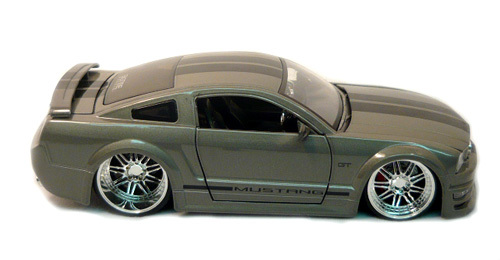 This is a 2006 Ford Mustang GT 1:24th Scale by Jada Bigtime Muscle Die Cast Collector Series. This muscle car has doors that open to reveal a black interior with chrome steering wheel and rear view mirror. It has bucket seats and center shift council. The hood opens to a detailed black engine. The trunk also opens on this free wheeling model. It has the dub chrome wheels and black wall tires. Approximate dimensions are 8.5 inches long x 3.25 inches wide x 2.5 inches high. Shipping weight is 1.4 pounds.